Noah asks: Why is it that aluminium foil on the outer part is very shiny, but the other side isn’t? The most abundant metal in the Earth’s crust, aluminum naturally occurs as a compound with other elements, such as aluminum oxide or potassium aluminum sulfate. As such, it was not isolated as a separate element until 1825 when a Danish chemist, Hans Christian Oersted, was able to produce a small amount. By 1845, a German chemist, Friedrich Wöhler, had perfected a way of producing enough aluminum to be able to study it. In 1854, the French chemist, Henri Étienne Sainte-Claire Deville improved on Wöhler’s method and developed a process to commercially produce the element, although it still remained expensive, even more than gold. Other improvements were made independently by chemists Charles Martin Hall (American) and Paul L.T. Héroult (French) in 1886, and by Karl Joseph Bayer (Austrian) in 1888. As a result, sufficiently large quantities of aluminum oxide were now able to be produced from bauxite, and then aluminum could easily be obtained from the aluminum oxide. This greatly reduced the cost of aluminum, and in 1888, Charles Martin Hall formed the precursor to the Aluminum Company of America (Alcoa), the Pittsburgh Reduction Company. Production methods continued to improve and by 1909, the Pittsburgh company’s output was at 41,000 kg per day. By 1910, the first manufacturing plant for the production of aluminum foil opened in Emmishofen, Switzerland by Dr. Lauber, Neher & Cie. So why is aluminum foil shiny on one side and not as much on the other? In what is called the Bayer Process, after pure molten aluminum is obtained from aluminum oxide, it is placed in furnaces with a small amount of other elements (typically the final product will be between 99.8% and 99.9% aluminum). This liquid is then poured into “chill casting devices where it cools into large slabs called ‘ingots. '” Next the ingot is treated with heat (annealed), and then rolled between heavy rollers. This initial foil is sent through still more rollers, several times, until it reaches the desired thinness. For the type of foil that is bright on one side and matte on the other, it is so thin that during some of the last rollings, two sheets of the thin foil must be placed together lest they tear or crimp during the final rolling of the sheets. One consequence of this is that while the sides that touch the highly polished rollers are burnished to a bright finish, the inner sides that touch the other aluminum foil remain matte. 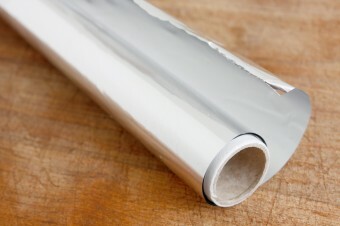 Before aluminum became cheap and readily available, during the last part of the 19th and early 20th centuries, a type of thin foil, used commercially, was actually made of tin (tin foil). Because of the popularity of this foil, today many call aluminum foil this name. It’s estimated that there is 82.3 grams per kilogram of aluminum in the Earth’s crust. More than just packaging, aluminum can be used to polish silver: after lining a deep pan with foil, cover it with cold water and add a couple of teaspoons of salt and your silverware. Chemistry (magic) will remove the tarnish. A similar process can be used to clean jewelry, except exchange the cold water for hot, and the salt for a tablespoon of laundry detergent. Likewise, a sheet of aluminum foil underneath freshly polished silverware will deter tarnishing. Scissors can be sharpened by cutting through several layers of aluminum foil a few times. In 2013, 50,602 thousand metric tons of aluminum were produced globally, with China topping the list at 21,936 – an amount far greater than the next largest producer, the United States with 4,918. In fact, the United States imports aluminum from China (about 5% of its total), although by far it gets most of its imported aluminum from Canada (62%). In the U.S. in 2012, 34% of aluminum was used for transportation, 26% for packaging, 12% in building, 9% for electrical, 8% for machinery and 7% for consumer durables. The country’s five main smelting companies primarily produced 2,000 thousand metric tons of the metal. Of the nearly 3.4 million tons of aluminum recovered from scrap metal, 53% came from manufacturing, while the remaining was from discarded products. Sixty-five percent of aluminum used in the United States is recycled, and this includes an average of 123,097 cans each minute. Most aluminum cans are made with at least 50% post-consumer recycled aluminum, and it takes about 90 days for the aluminum from a used can to be back on a store shelf. Aluminum’s ability to be recycled is unlimited, but sadly, 36 billion cans were placed in landfills in 2013; they will not degrade, and will still be cans, in 500 years. Although aluminum foil can be recycled, most recyclers insist that it be clean first. “It’s estimated that there is 82.3 grams of aluminum per kilogram of the Earth’s crust. yes. that was an awkward unit of measurement. More importantly, when you make an aluminum foil hat to deflect the mind control rays, is it shiny side out or in? It doesn’t matter. The tinfoil hat was invented by the NWO to focus the very mind control signals that their greatest opponents think they’re blocking. You’re putting a portable antenna on your head!! Shiny side out, that way big pharma and the government (cough illuminati) can’t get you with their mind control rays left over by the alien civilisations that preceded us. This was amazingly awesome to learn. Thanks so much for my newest education on aluminum foil! !